Planned Tiny Towns across Canada. Full-time jobs created in Tiny Towns across Canada. Planned social program houses in Tiny Towns across Canada. Planned Affordable Tiny Home sites in Tiny Towns across Canada. The revolutionary concept of Tiny Homes expands the options available in home ownership and addresses the needs of a changing population. While a plan for a community can help the vision be realised, changes in society's tastes need to be addressed to ensure that a community continues to thrive. By incorporating a Tiny Town into the community, planners can prepare for the inevitable demand for this new housing option. Some of the first adopters of the Tiny House concept are the Millenial generation. These are singles and couples with post-secondary education, carry heavy tuition debt, but have budding careers. Without the accumulation of a lifetime of stuff, Millenials are gravitating to the simplistic lifestyle that Tiny Homes require. Baby Boomers that are now empty nesters or widow(er)s are beginning to view Tiny Homes as a retirement option. With a desire to eliminate a lot of the stuff in their lives now that their children have moved on, along with the attraction of living expenses that can better fit a fixed income, Boomers are seeing Tiny Homes as a potential next step. Many communities are realizing that Tiny Houses can provide affordable housing for those that are currently supported by the community through social programs. Tiny Houses can be another way for communities to help less fortunate people transition away from social programs while ensuring they have their own space, out of the elements. A Tiny Home is an affordable housing option. A Tiny House can be moved to a new location. Tiny Houses cost less to operate and are a more green living choice. A Tiny Home is an asset which can be sold when no long required. 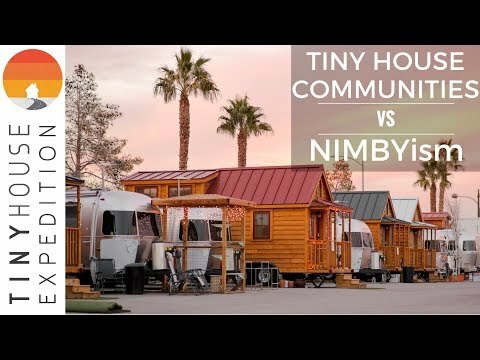 Our Tiny House Summit Keynote: "Crafting Community in a NIMBY World" Exploring the diversity of tiny house communities across the US. An in-depth look at various existing community models—the pros, the cons, legalities and feedback from the neighbors. Subscribe now to follow our progress on Making a place for Tiny Homes. Will your products/services help us build/operate/manage our Tiny Towns? Partner with us to make this project a reality.